Camden GTI Vee Dub Spares began in 2005 in English teacher Matthew White’s shed in Camden. Matthew migrated to Australia from the UK with his pregnant girlfriend and not much else. Since a young age he had a passion for cars and was a VW enthusiast. When he migrated to Australia he began importing car parts for his cars from the UK. Persuing his hobby and passion for VW, he identified a niche market in Australia. He decided to turn his hobby/passion into a business venture. It was with the help of NEIS (New Enterprise Incentive Scheme) that this dream became a reality. Camden GTI is now a 10 years strong thriving Volkswagon specialist workshop and spare parts company. Camden GIT has 6 employees plus the main man himself, Matthew who is dedicated to preserving the future of Volkswagen Audi Group (VAG) vehicle repairs and servicing. He achieved MIAME grade with the IAME, the highest grade of qualified motor engineer. A strong supporter of the Australian Apprentices and Traineeships Scheme, he firmly believes in hiring, training and investing in young people. Camden GTI Performance employs 2 full time apprentices, Austin is in first year and Alex is a 3rd year apprentice. Tarn and Monika, who work in the office, both started with traineeships. Camden GTI has three fully qualified mechanics, who specialise only in VW - Steve, Matthew and Ashley, as well as Ray who is specialised dismantler. Interesting to know that one of his mechanics is female (Ashley) who has come from Audi to work with Camden GTI. Matthew is big on giving everyone a fair go and this isn’t just evident with his employees but also with his business. He runs a tight ship but ensures it is a fun and safe environment for both customers and employees. Matthew is very particular about how he runs his business, and as he puts it “because of my OCD, my work shop, parts warehouse and yard are always clean and tidy- I am very proud and I love the reaction I see from customers when they walk in and see just how neat and tidy everything is. Customers are used to seeing a work shop or a spare parts shop dirty and messy, not mine- and I’m proud of that”. catalogue of new and used parts for all conceivable applications. Full warranty is given on all parts and services. Camden GTI prides on providing the very best customer service and are always happy to take the time and discuss any concerns customers may have with their vehicles. The site is approximately 2000sqm with the warehouse holding about 2000 parts, stocked from floor to ceiling! They also offer ample parking space for their customers. Every year for the last 5 years Camden GTI has donated a car to be raffled in VEE DUB National Show. The proceeds are all donated to Sea Shepherd Australia - a non-profit conservation organisation whose mission is to end the destruction of habitat and slaughter of wildlife in the world’s oceans in order to conserve and protect ecosystems and species. Matthew plays ‘Mr Mum’ to his 2 boys, James 14 and Marcus 10, every 2 weeks. He really enjoys the time he spends with his boys and hopes that one day the boys take over the business. Matthew’s hobbies are roller skating, camping and he has track car that he doesn’t race as often as he’d like to. Although Matthew remembers 90% of what is in his warehouse and yard , he says that keeping up with paper work, the tax man and all legalities and practices are important parts of running a successful dismantling business. Matthew ensures that all parts are taken with care when dismantling – “I like all the bolts attached to the part I need. I like to get as much out of a car as I can making sure there is very little wastage. I feel there is so much waste these days with (dismantling) cars”. Keeping track of stock was once a matter of knowing what stock and remembering all the parts. Matthew now has a stock system that enables easy access to what he has in stock- it’s now in the computer not in his head. “Part of running a successful dismantling is having an intelligent storage system. What not to do if you want a successful yard is to keep stock that isn’t needed- in our business every part can be resold so it’s easy to keep an entire car. So it’s a matter of keeping what you know will sell and not store parts for the sake. I keep unusual cars and parts for the old cars that have ‘soul’” Matthew said. When asked how the Australian dismantling industry could be improved, Matthew’s passion for the environment and recycling cars was evident. He finds that a ‘write-off’ these days needs to be reassessed and reconsidered, “it shouldn’t be an insurance company making the decision, it should be the RTA or a governing body. There are so many cars that can be repaired and put back on the road but can’t because they are ‘write-offs’. This is hurting our business and the second hand car dealer business. And not really addressing the issue of recycling” Matthew said. Camden GTI have take advantage offered by the every changing online business world.They also have an eBay store where they have close to 250 parts listed. www.vwwatercooled.com.au, Australia’s best source for local and international Volkswagen, Audi and Skoda News. 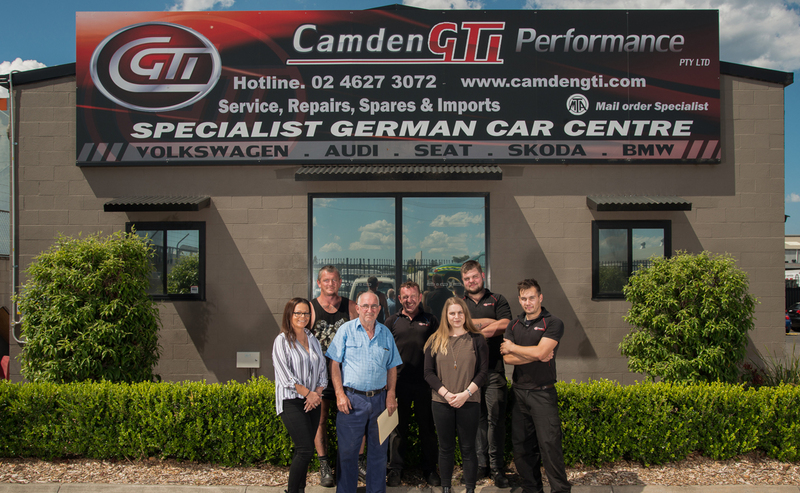 What makes Camden GTI unique is they really know their German cars and are specialists in Volkswagens, Skoda, Audi, and Seat, providing service to a niche market of VW enthusiast in Australia. Camden GTI isn’t just a wrecking yard or a repair shop, it’s a recycling centre with a passion for VEE DUB. For the future, Matthew sees the business growing and becoming Australia’s number one German car recycling business.